over to tell me the car was in great condition, the engine had just been rebuilt and it was only $6,500. I found this pick-up in Glendora September 22, 2003. It had belonged to the sellers uncle and had been in the family for about 50 years. Since the purchase I have installed a fresh engine, installed a Ruckstell, re-cored the radiator and have re-built the outside rear brakes. I found this Doctors Coupe at the original owners estate sale August 15, 1981, in Plano Texas. The car had been stored in a pole barn since 1954 and with a new battery, fresh gas and oil and water in the radiator the car started right up. The car ran amazingly well until 1983 when I tore it down for a frame off restoration. The restoration included everything mechanical, complete paint and interior and new tires. I have driven this car thousands of trouble free miles. It is stock except for a distributor, outside brakes and a Ruxtell 2 pseed rear end. I bought this Fordor in August 2010 from Eric Gator Gould of Monroeville, Alabama. The car was restored by a man in Peru Indiana and purchased by Bob Smith of Huntington, Indiana. George Roberts, a retired machinist for the Fort Wayne Newspapers purchased the car in 1991. He wrote me, “as cars became harder and harder to work on I wanted something I could repair”. He did all the repair work for the 18 years he owned it. This original GMC pickup truck is the result of spending too much time on the internet (where I located it). According to my research 162 of these vehicles were made in 1954 in the Oakland, California plant, and this truck was first registered in California. 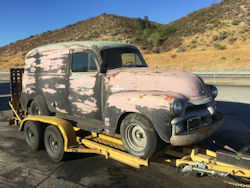 One of the last true survivors, this 1954 GMC Suburban has virtually no rust because it was originally purchased by the Castle Rock, Colorado fire department and spent most of its life parked inside. It has a Hydromatic transmission and 56,000 miles and drives like a new vehicle. In the late 1920s, the temperate climate of Southern California drew many people to migrate from chillier places, and that included Paul Helms, a New Yorker who came out in 1926 to improve his health. He opened up a bakery at the corner of Venice and Washington on March 2, 1931, and had in his employ 32 people…and 11 trucks, Helms called coaches. In 1937 the DIVCO was completely redesigned with a welded all-steel van body and a snub-nosed hood which was used with virtually no change up to the end of production. A huge new plant was built on Hoover Road near Detroit to manufacture the first snub-noses which appeared in service in 1939. Canopy Express vehicles were popular from the late 1920’s through 1955. They were mostly used to for neighborhood fruit & vegetable vending routes. My 1954 Chevrolet was an exception and originally purchased by the University of Arizona for use as the Tuscon campus plumbing repair truck. This is rare transition year model and there are very few left. The 1954 & 1955.1 have a unique dashboards, grill work and a one piece windshield.